Queen Mary Theatre Company is a platform for students with a huge variety of interests in the performing arts to experiment and develop their creative skills in an encouraging and collaborative environment. Whether your interest lies in acting, directing, writing, costume & makeup, administration, production, tech, or simply being a spectator, QMTC offers an avenue to explore and refine your skill or hobby. QMTC operates both as a Student Union Society and as a self sufficient Theatre Company. We strive to create a non-exclusive, encouraging environment where students with a multitude of interests in the performing arts have the opportunity to experiment, refine and collaborate. 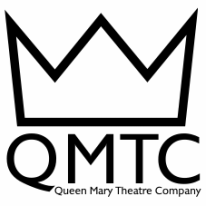 QMTC is run by a committee of students dedicated to organising THE PERFORMANCE FESTIVALS and events for the year. You can find out more about what we each do on our Committee page. Professional theatre companies that have come out of Queen Mary include: Figs in Wigs, Dark Hills, Prop Up Theatre, sh!t theatre, and Splutter Theatre. BE SURE TO FOLLOW US ON FACEBOOK, ﻿TWITTER﻿, AND INSTAGRAM TO KEEP UP TO DATE WITH EVERYTHING WE DO AND MORE DETAILS ON HOW TO GET INVOLVED!